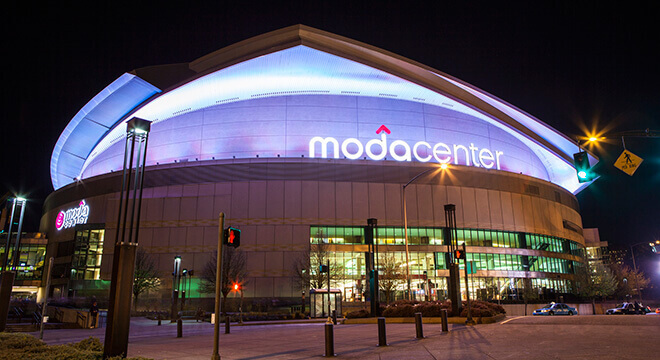 Moda Center, formerly known as the Rose Garden, is the primary indoor sports arena in Portland, Oregon, United States. It is suitable for large indoor events of all sorts, including basketball, ice hockey, rodeos, circuses, conventions, ice shows, concerts, and dramatic productions. The arena has a capacity of 19,441 spectators when configured for basketball, fewer for other events. The arena is equipped with state-of-the-art acoustics and other amenities. It is owned by Vulcan Inc., a holding company owned by Paul Allen, and is currently managed by Anschutz Entertainment Group and AEG Live. The primary tenant is the Portland Trail Blazers NBA franchise, also owned by Allen.